I decided I wanted to step away from my usual genre's and take a pot luck chance on a book to take away with me, which was slightly out of my normal comfort zone. 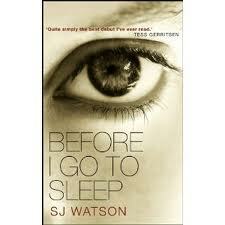 After hearing from the author S.J Watson about his book on the new bookclub programme I decided to give Before I go to Sleep a try. I read this book in only a couple of hours and wow was this a compelling read! From the first chapter it was mind boggling and I was gripped. All the way through the book I found my opinion of each of the characters surrounding Christine changing. There is no way of predicting the outcome of this book, the suspense has you flicking through the pages in no time eager to find out what Christine is going to write in her diary next. We really get to connect with Christine's character as we get to know Christine at the same time as Christine begins to find out about herself. It is hard to believe this is a debut novel as this book is just perfection on every page. This is truly a thrilling read and a storyline that has you literally on the edge of your seat. I couldn't agree more. I loved this book! It is an easy read. Even though it becomes a quite predictable story, it keeps you interested until the end. This book is an unexpected gem!! Surprises, psychological insight and suspense, unique perspective. I could hardly put it down. Just when you think you have answers, as in life, there are new fears, doubts and revelations.